Yes, I know. Apple blogs and tech sites are making claims because 9to5Mac found a patent the company was awarded covering a Watch with a round face. Ever since the Apple Watch was released, some potential buyers and fans of traditional watch design have been insisting that Apple HAS to adopt a rounded design, or risk being left behind. Despite Patrick Austin of Gizmodo’s assertion that the “…Round Apple Watch Dream Won’t Die,” history hasn’t agreed so far. Here’s the problem with that statement. Multiple companies using three different competing platforms adopted rounded designs to differentiate from Apple’s Watch. How much did it help them? Pebble no longer exists and Google’s re-named Wear OS has been left in the dust. Samsung has managed to hang around in fourth place, but the Apple Watch leads the wearables industry in both profits and market share, and it shows no signs of stopping. This really isn’t much of a race anymore, so Apple passing on a forced round design worked out just fine for them. We all know that you can only read so much into Apple patents, because they often cover hardware and features that they never intend to bring to market. In my opinion, that is likely the case here. Why, you ask? Because Apple’s original Watch design already won. There isn’t a single, solitary metric based on sales or market share that disagrees with this statement. Apple’s Watch is the unquestioned leader among smartwatches despite no shortage of circular competition. What would be the point os shifting away from this success right now? I won’t say that Apple will never release a round version of the Apple Watch. There may come a point when they decide that a design overhaul is warranted and move in that direction. However, I don’t think that time is now. Not yet. As successful as the Watch has turned out to be, it has been a slow buildup over the course of three years. Because of that, tweaked versions of the current square designs should still have plenty of legs. A key reason for Apple to maintain the current design or similar for a while longer is the popularity of bands for the Watch. These accessories may not cost much compared to Apple’s hardware, but the profit margins that they bring are nothing to laugh at and definitely add up. With the popularity of the Watch increasing and growth still ramping up, why shift gears now? As we all know, that isn’t Apple’s style. They will stick with a successful design longer than this before moving onto the next thing. So if you are expecting Tim Cook to take the wraps off of a round-faced Apple Watch at WWDC next month, don’t get your hopes up. Apple’s square face stands in strident opposition to the rest of a largely unsuccessful group of competitors. Why abandon what is working so well for a rebrand right now? 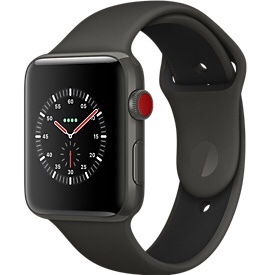 I predict that Apple will continue with variations on the current design that maintain compatibility with the watchbands that are on the market for at least another year or two. This is what Apple does. Why would this time be any different?